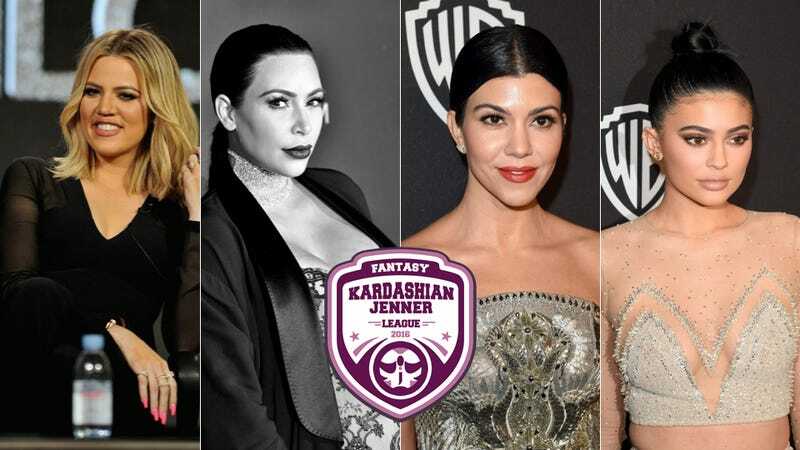 This is the fifteenth and final week of Jezebel’s first annual Fantasy Kardashian-Jenner League, a fantasy league about the Kardashians, the Jenners, and closely-related family members. The rules are here. The season ends today. Everyone and no one! But also, Team Bible, because Kim Kardashian is still apparently the most bankable and bloggable member of this family, despite swift ascensions by Kendall and Kylie in recent years. This season was rough, it was tumble, it was marked by an astonishing preponderance of FitTea #spon posts, but it taught us some fundamental truths about life: being a member of the world’s most famous family isn’t all roses and Balmain, and it can even be a struggle despite well-selling advice books and perfectly styled (by a stylist) paparazzi shots of you walking to or from the gym. What really succeeded in this first annual Fantasy Kardashian-Jenner League, the most important sport that ever occurred, was savviness about the draft, just as with any lesser sport. Team Bible bested the others because of Coach Clover Hope’s gimlet-eyed perspective about this tough business, and because of one smart foresight only she was anticipating: the popping of that miracle baby, the one true lord (no diss to Disick), Saint [no middle name] West. That kid is gonna be a hall-of-famer, and the rest of us will learn forever from Coach Hope’s strategy. If you can’t cook, don’t bother entering the kitchen. Kylie Jenner strategically used a Louis Vuitton purse to shield the goods, but the stairway to the gym became a stairway to heaven. Here’s what’s not a stretch ... she looks hot. Performance summary: Thirty. Thirty! 30. Is this my lowest score of the entire season? Perhaps. Perhaps not. I don’t feel like checking because I’m far too excited to finally extricate myself from this nightmarish league—a league for which I was forced to draft some of the most uncooperative and disappointing team members from the entire Kardashian-Jenner family. Throughout the past couple months I have been embarrassed week after week by these losers and their lack of commitment to the game, and am relieved beyond comprehension to have them out of my life for good. Images via Getty. Logo by Bobby Finger.